RP1050SS is rated 4.8 out of 5 by 5. Rated 5 out of 5 by Todd from It works great! Rated 5 out of 5 by Bill55 from Much better than the original On the original there were some serrations but nothing to really grip the nut if it was stuck, and they always are. 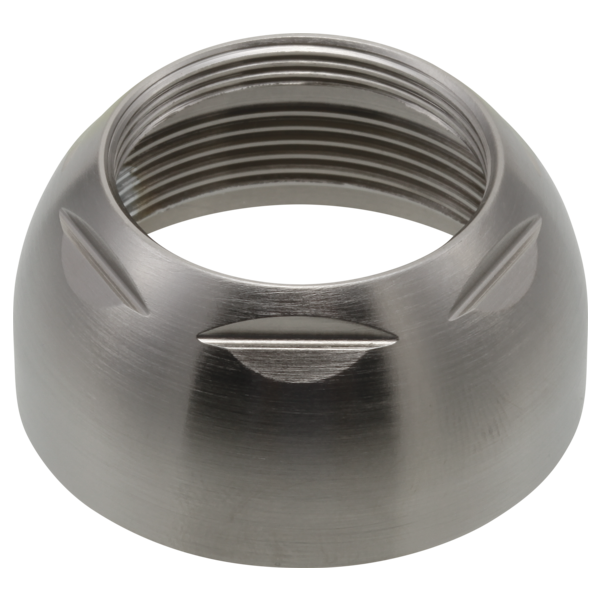 The new ones have a shoulder which allows you to get a better grip with out damaging the nut. Rated 5 out of 5 by Greatcontender from nothing like OEM If your repairing something and you have the chance to use the original parts from the manufacturer your chances of being satisfied with the results are far better. I have used others and will always purchase OEM if I have the chance. Rated 5 out of 5 by AndyMH from Better than the original Easy to replace and just what was needd. Rated 4 out of 5 by Fixitgirl from Delta kitchen faucet This was a replacement for a part I nicked trying to remove with the wrong tool. It fit perfect and looks good. What socket fits this nut? It was a little tricky but I sealed the gap between the bonnet and the faucet body base with strips of packing tape except for a small area in the back (the high side) so I could carefully apply Liquid Wrench to my bonnet threads. I applied several small applications over the course of 3 days to help loosen the potential build-up and corrosion on the cap threads (apply this on the bottom only, not the top where the plastic adjustment ring is under the handle...that won't help this!#. I purchased a 33mm 6-point deep socket #1/2&quot; drive) at my local auto parts store and it fit this bonnet hex head perfectly. Using a 1/2&quot; drive breaker bar, the bonnet cap came right off with little effort, no scaring or damage to the chrome finish. Btw, someone else here in another post notes using a 34mm socket but I found that was too loose for my bonnet cap. In my case, the 33mm 6-point socket was a perfect fit. Does the Bonnet Nut come with two o-rings attached? Is this a 2 inch dia? I am looking for a PN Rp1050 in flat black? how do you remove the Delta Bonnet Nut? Is the Pearl Nickel finish available? I have the Waterfall Single-Handle Kitchen Faucet Model 172 in Pearl Nickel. I need a replacement Bonnet Nut, is one available?